Now this is an episode I have been waiting for since Abraham flashed that store-bought red hair. 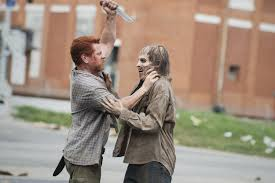 Michael Cudlitz is such an outstanding actor and he did not disappoint. Finally getting to see his backstory was enlightening and heartbreaking. By trying to take care of his family, he only succeeded in making them frightened of him. It was a really brilliant use of very short, but very impactful clips of Abrahams past that brought everything full circle. Heartbroken enough to take his own life after seeing the aftermath of his rage over canned food, Abraham was saved by a man on a mission. Eugene used the magic word - "mission" and there is no way that the Sargent in Sargent Abraham could not respond to that. Oh Eugene, I was beginning to think that you were never going to admit that you didn't have a cure. The very worst thing about this admission is what it means for Abraham. Abraham literally pinned his life on the fact that Eugene had a cure. Now that this is no longer the case, what will that mean for Abraham? Will he become even more unhinged or will he eat his gun? You know what will be even more interesting? To see what Rick thinks about all of this. Abraham fractured the group by taking Glen and Maggie on a nonexistent mission. Hope that red handled machete isn't around when he finds out about all of this. The scene where Eugene hums over everyone showing off their newly acquired survival skills was brilliant. Everyone went into that bookstore and did something productive: using toilet water, a can, wire hangers and fire = drinkable water, thread from the binding of a book = stitches for Abraham and everyone knows that bookshelves should be used as window barricades. It's always really interesting to see how far our survivors have come. 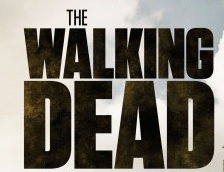 Bonus apocalypse education gleaned this episode; a fire hose can take out a group of walkers like nobody's business! It is a little bit lazy on our group's part to not have seen that giant, red sign indicating that there were walkers inside. Uh duh, why else would a functioning vehicle with gallons of water in it still be parked there? "Self Help" was an interesting and productive episode. We learned a lot about Abraham without "wasting" an episode on him, we finally know the truth about the trip to D.C. and they finally made Eugene more than just a mullet who says awkwardly funny things. Eugene has been accepted into the group; what will everyone's reaction be now that they know he has been lying? Maggie was just telling Glenn that she felt guilty about leaving the rest of the group and she just had a heart to heart with Eugene in hopes of making him feel comfortable. (Has anyone else noticed the amount of biblical references there has been this season?) What will she feel now that she realizes she's been lied to? Is this the event that we needed in order for everyone to reunite? It that's the case, then great, but I do hope that this whole "I'm not a scientist" thing doesn't just get swept under the rug. Carol had to be excommunicated in order to pay for her sins:what will Eugene be subjected to? The truly awful thing that Eugene did by admitting to his lie? He took away hope that something could save them. At this point, what does everyone have to live for? Are they just going to try to find an area where they build their own, non violent, Terminus? That worked so well at the prison. (sarcasm) What, exactly, is it about human nature that does not allow for the survivors to come together and rebuild society? Next week will bring us Daryl and Carol and I am truly on pins and needles over what they find. How does Carol end up being wheeled into the hospital at the end of Beth's episode? Do Daryl and Carol run into Noah and he tells them what the deal is with the hospital? Who the hell was hiding in the bushes when Daryl returned to the church?! Everyone is at a crossroads and it will be very interesting to see how they all find their ways back to each other because they always do.